You are currently browsing the The Pet Product Guru blog archives for the day Tuesday, November 3rd, 2009. 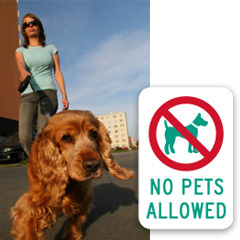 Live in an animal friendly apartment – follow the rules and keep your dog on his dog leash and clean up after him. I was in real estate and one of the most annoying things to me is that so many of the condos and co-ops in Bergen County, N.J. do not allow pets! This made my job a lot more difficult because according to a recent apartments.com survey of more than 1,000 renters around the U.S., nearly 90% who responded said that they have an animal. More than 80% said an animal friendly policy played a major role in where they chose to live. 30% sought out an apartment in close proximity to desirable animal amenities such as dog parks, walking trails and a veterinary office. There were more than 11 million searches for animal friendly apartments on apartments.com in 2008. Nothing annoys me more than a co-op or condo complex that does not allow pets. They’re too lazy to develop and enforce rules and regulations! Face it animals and a part of most of our lives. These places should get with the program or they may stay vacant for a very long time and it serves them right. If you are lucky enough to live in a pet friendly building, follow the rules, walk your dog in designated areas, keep him on his dog leash and clean up after him. If you own a pet, don’t even consider a co-op in Bergen County, NJ. The rules are ridiculous and pets are out without a doubt! !